When I think of Autumn and Winter food, apple and cinnamon is a combination that automatically comes to mind. They evoke feelings of being cosy and warm – which is very much needed at this time of year! 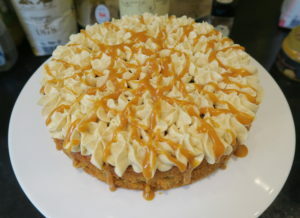 I’ve made this Apple Cinnamon Cake with a moist apple sponge, a cinnamon buttercream and lashings of salted caramel sauce. It’s a winter warmer in a cake! 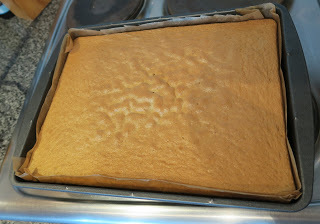 To make the sponge I started by creaming the butter and sugar together. I added eggs, and whisked well. Then I mixed in self raising flour, grated apple and some cinnamon. 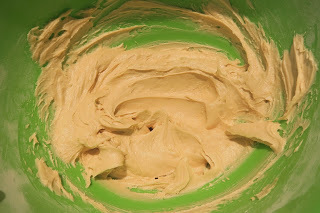 I divided the mixture between three 8″ tins and baked for 35 minutes until golden. To make the buttercream I mixed together butter, icing sugar, cinnamon and vanilla until smooth. 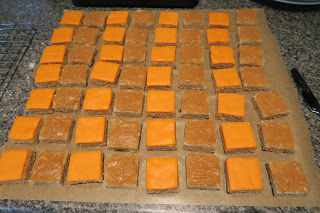 Then I started stacking up the sponges, I piped buttercream and drizzled caramel sauce between each layer. 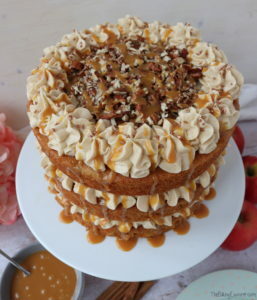 I finished the Apple Cinnamon Cake with more cinnamon buttercream on top, more salted caramel sauce and some chopped pecans to finish. 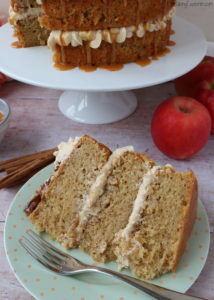 The Apple Cinnamon Cake was absolutely divine and so full of cinnamon flavour! I’m linking this recipe up with Cook Blog Share hosted by Recipes Made Easy, Baking Crumbs hosted by Jo’s Kitchen Larder, and Fiesta Fridays hosted by Of Goats & Greens and Apply To Face Blog. 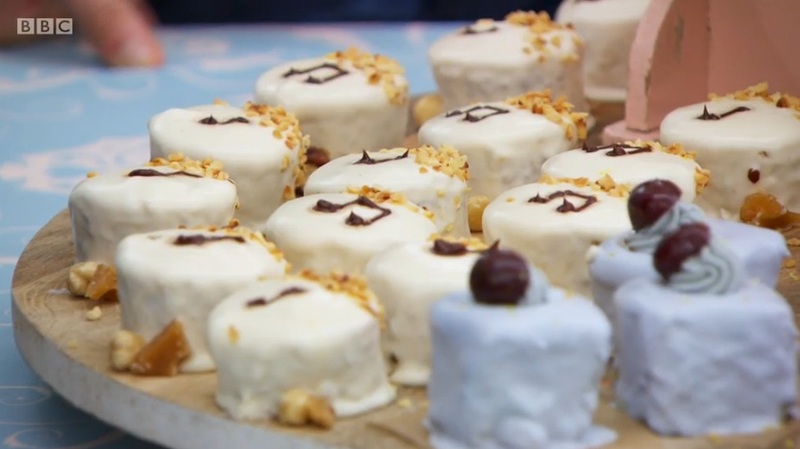 Why decide between two desserts when you can combine them? 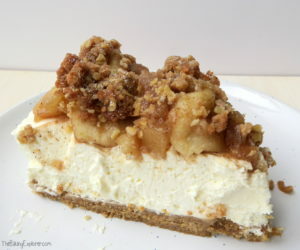 This apple crumble cheesecake has all the delicious flavours and textures of both an apple crumble, and a cheesecake! The biscuit base, crumble and apples are all laced with cinnamon and spices, making this dessert ideal for Autumn. The apples are a perfect balance of tart and sweet, the crumble and biscuit base provide crunchy texture and the cheesecake base is so creamy and light. It’s also really easy to make! The cheesecake is no bake, the apples just get chucked in a pan and left to soften, and the crumble only needs to go in the oven for under 10 minutes. The only hard part is waiting for everything to cool and set, but trust me, it’s worth the wait! I started by making the apple topping as it takes a while to cook down, and then needs to fully cool. 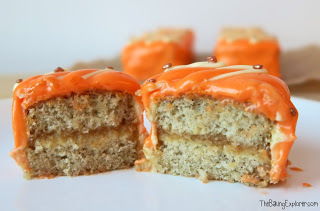 I put them in a pan along with the cinnamon, mixed spice, light brown sugar and maple syrup. On a low heat I let it simmer for around 25 minutes, until about a third of the apple pieces had gone mushy, and the rest were fully soft but still intact. I let it cool completely, then put it in the fridge to chill. 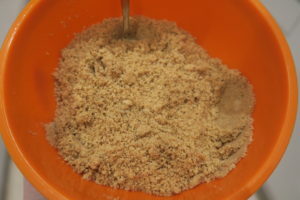 To make the base I used my food processor to whizz up the digestive biscuits into crumbs. I stirred in the cinnamon, added the melted butter and mixed it all together. I pressed it into the bottom of a 23cm springform tin, then put it in the fridge. 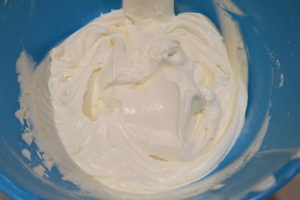 To make the cheesecake filling I used my electric hand whisk to mix together the full fat cream cheese and icing sugar until smooth with no lumps. 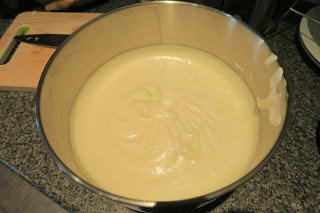 I added the vanilla and the double cream, and whisked it until it was thick. 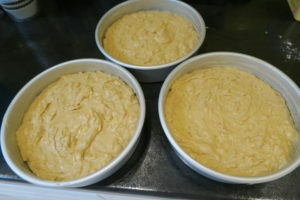 I poured it into the tin and smoothed the top so it was level. Then I put it in the fridge overnight to set. 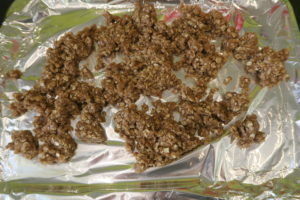 The next day I made the crumble topping by mixing the ingredients together then spreading it out onto a baking tray and baking for around 7 minutes, I bashed it up so it wasn’t in big chunks, then let it cool completely. To assemble the apple crumble cheesecake I removed it from the tin, then I used a butter knife to smooth it all around the edges. I piled the apple mixture on top, then covered it with the crumble, then finished it with a sprinkling of icing sugar. 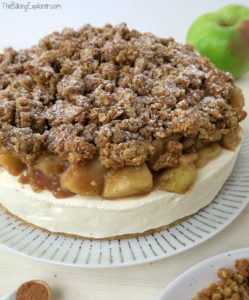 This apple crumble cheesecake is probably one of the most delicious things I have ever made! 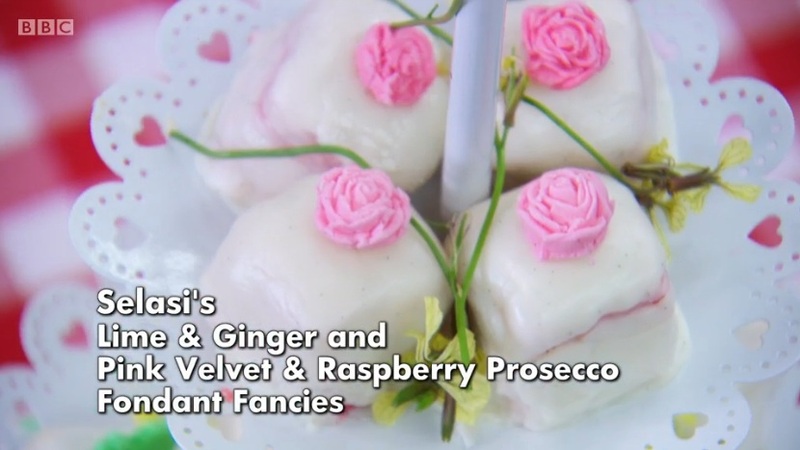 I served it at a dinner party and everyone loved it, one guest said it was ‘like crack’, and whilst they don’t have any personal experience of that, I’m taking it as a compliment! 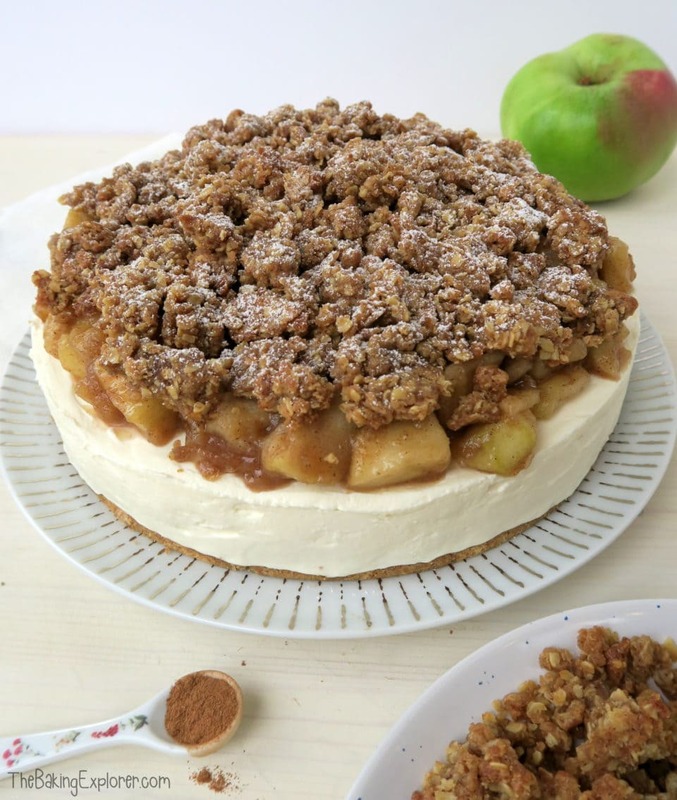 If you love cheesecake and you love apple crumble, but you just can’t decide between the two, then apple crumble cheesecake is the dessert for you! I’m linking this recipe up with Recipe of the Week hosted by A Mummy Too, Cook Blog Share hosted by Recipes Made Easy, and Fiesta Fridays. I hope you all had a wonderful Christmas! You probably know if you follow my blog that I absolutely hate to see food wasted or thrown away, so I’m always looking for ways to use up leftovers and avoid any having to go in the bin (one day I will have a garden with a compost heap!). Food waste happens so much more than usual over the festive period so I’ve been doing my best to use up what I can. I found this awesome recipe for a Parsnip & Maple Syrup Cake and it was just perfect as I had exactly the right amount of parsnips left over from Christmas dinner to use up. 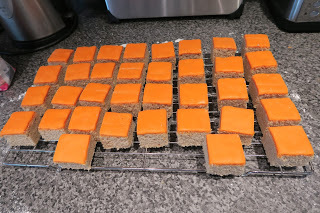 I’ve made cakes using courgette and carrots before, but never parsnip so I was also excited to see how it turned out. 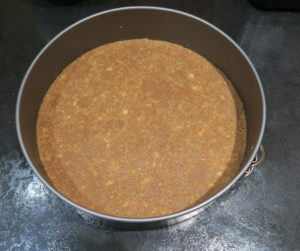 I started by lining and greasing a loose bottomed 22cm cake tin. 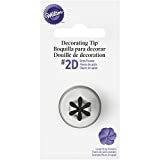 You can also use two sandwich tins if you wish. I melted butter, light brown sugar and maple syrup on a low heat. I let it cool slightly. Use pure maple syrup if you can (not maple ‘flavoured’ syrup), I was lucky to receive some Canadian maple syrup as a gift. 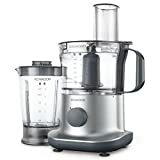 I grated parsnips and an apple using a food processor. I added the zest and juice of 1 orange. Into the cooled butter mixture I whisked eggs. I then added the dry ingredients; self raising flour, mixed spice and baking powder. Finally I folded in the grated parsnip mixture, as well as pecans. I poured the mixture into my tin. I baked the cake for around 1 hour on 160C/325F/Gas Mark 3. 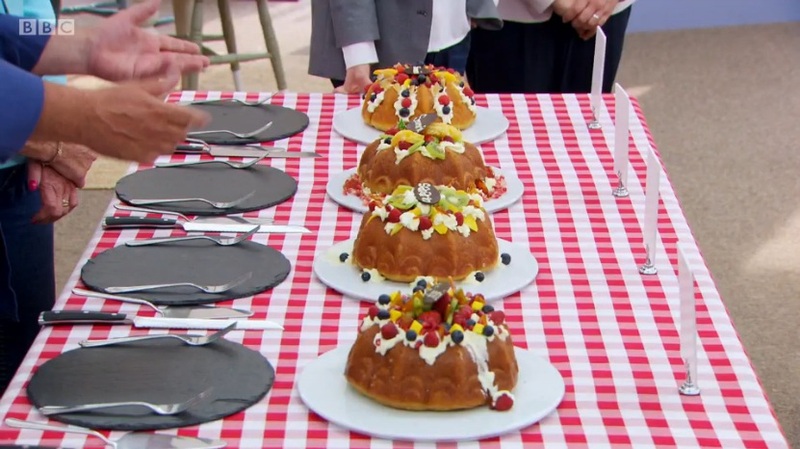 Make sure it is done in the middle by testing it with a skewer as this is a very big and dense cake. 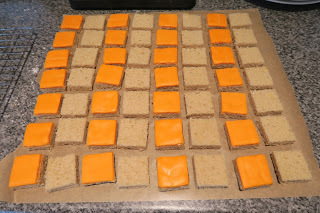 If you use two sandwich tins, you will only need to cook it for around 30 minutes. To make the filling I whisked mascarpone with maple syrup. 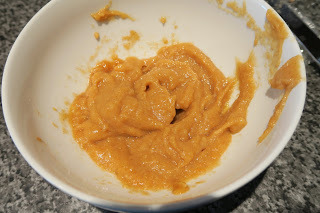 I used my hand mixer to do this as it thickened the filling nicely. I cut the cake in half and spread it over the middle. I put the other half of the Parsnip & Maple Syrup Cake on top and finished with a sprinkling of icing sugar. 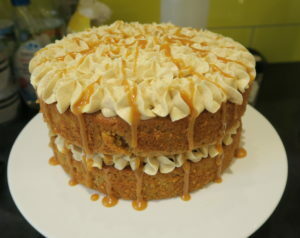 The Parsnip & Maple Syrup Cake was so delicious! I loved the freshness of the filling, the texture that the chopped pecans added and the overall flavour was absolutely scrumptious! I couldn’t have guessed there were parsnips in the cake if I hadn’t made it myself. Although it is of course still cake, it certainly felt like a healthier snack and made me feel much better after all the indulgence of the past week. To make the filling whisk mascarpone with maple syrup using an electric whisk. Cut the cake in half and spread it over the middle. 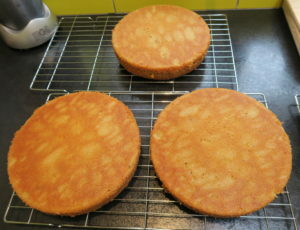 Put the other half of the cake on top and finish with a sprinkling of icing sugar. I had a craving for apple crumble last weekend. It must be the drop in temperature, it makes me want warm cosy foods. I’ve already had my first (and second!) mulled wine of the season, and I wanted to add those winter flavours and spices to this crumble to make it extra cosy and perfect for Christmas time. The other great thing about crumble is that it is so easy to make, once assembled it’s just a matter of snuggling under a blanket and waiting for it to bake. 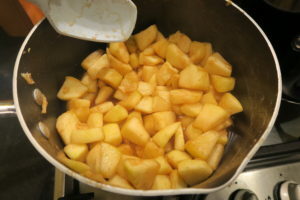 I started by peeling and chopping cooking apple into small pieces. It was about 600g of apples, but 3 large Bramley apples should do the trick. I added sultanas, light brown sugar, cinnamon, mixed spice, nutmeg and the orange zest. I mixed it all together and spread it out into a dish. My dish is 31x21cm (12×8 inches). For the crumble I mixed light brown sugar and plain flour together. I then added butter, cut into cubes and rubbed it with my fingers until it looked like breadcrumbs. This is quite a thick crumble topping, which is how I like it, so if you prefer a thinner layer take a third off the measurements. I spread the crumble topping over the fruit and baked it on 180C/350F/Gas Mark 4 for 45 minutes until golden and bubbling. Serve warm with custard for a warming and spicy winter treat! 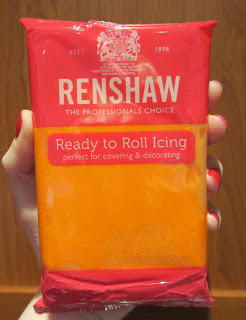 I decided to make a strudel as this is one of the most well known filo bakes so I thought it was a good place to begin. 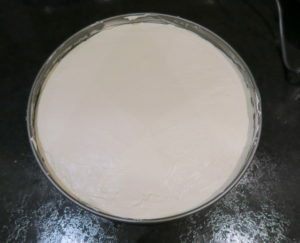 I started making the filo pastry by sieving plain flour into a bowl. In a separate bowl I beat egg with water, lemon juice and salt. 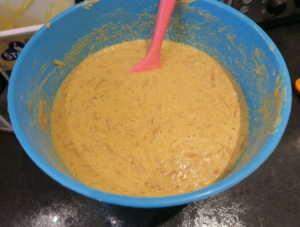 The recipe told me to put the flour on the work surface (hence the photo above) and pour the egg mixture into it. This is a bad idea. 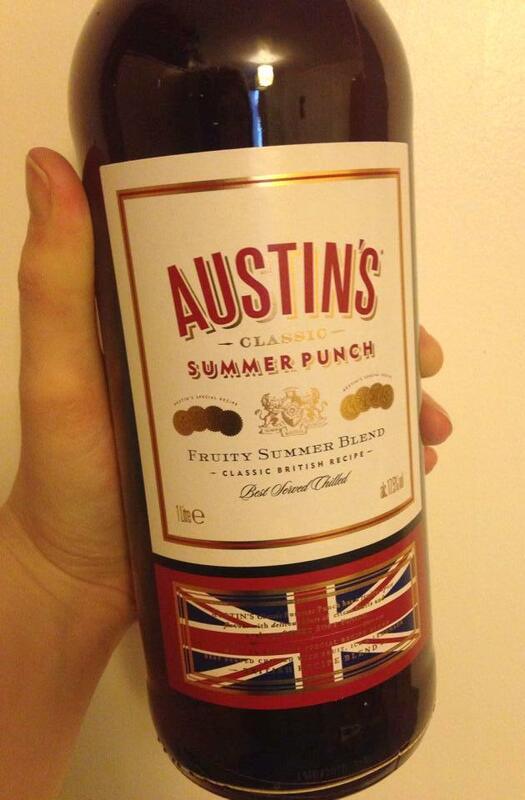 I do not recommend it as it is stupidly messy. 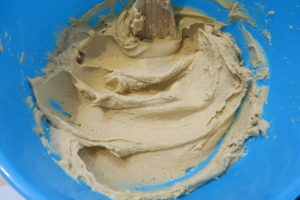 Just mix it in a bowl until a dough forms. 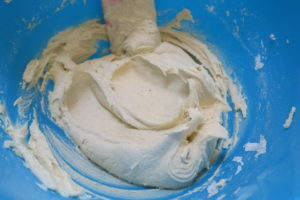 The dough will be quite wet, so knead it on a floured surface until it becomes smooth. This takes about 10 minutes. I oiled my hands to stop it sticking to them and found this quite effective. I covered my dining table with an old, but clean, bed sheet. You could also use a tablecloth. You may get butter or fruit juice on it so don’t use your best linen. Then I floured it evenly and well. 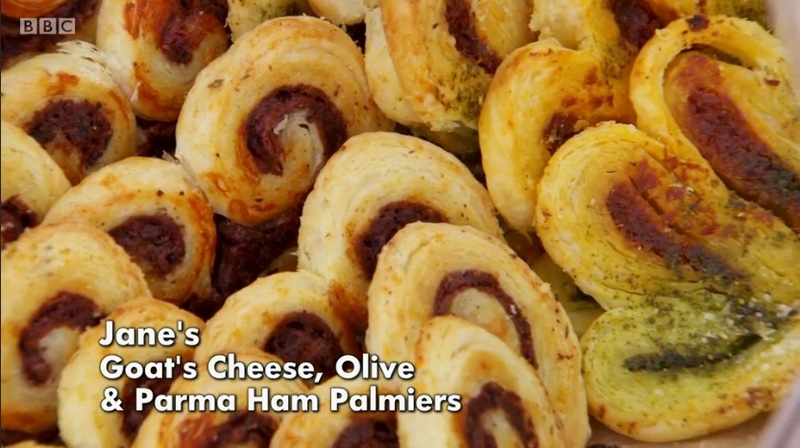 I rolled out the dough as much as I could with a rolling pin, then covered it with a damp tea towel for 15 minutes. I used more flour and kept the dough moving so it wouldn’t stick to the sheet. Then I started stretching! I pulled and stretched the dough gently, letting it stretch with its own weight. It wasn’t as hard as I imagined as it is naturally a very stretch dough. It did tear several times but I was expecting that so I wasn’t too concerned. It was hard to keep the edges thin and they stayed thicker all the way around. After brushing melted butter all over the dough, I sprinkled it with a mixture of soft light brown sugar, lemon zest and cinnamon. I then sprinkled it with blueberries, raspberries and apples. Using the bed sheet I rolled up the strudel gently and slowly. I put it on a baking sheet and left it overnight in the fridge. The next day a lot of juice had released from the fruit, I mopped it up but I was concerned about how thin the pastry looked on top, how soggy it was on the bottom and how many holes there were in it all over. So I made more filo pastry! I used half of the quantity and it stretched a lot better this time and I was much more careful about not making holes. I re-covered the top and bottom with pieces of the new pastry. It wasn’t the neatest but I felt more confident that it wouldn’t fall apart when baking. If I hadn’t left it overnight, I probably wouldn’t have done this. I brushed it all over with melted butter to make it nice and golden when it baked. It baked it on 180C/350F/Gas Mark 4 for 35 minutes. The fruit released a lot more juice, so I transferred it to a wire rack (with a tray underneath) to cool. You can of course serve it straight away, or let it cool then warm up later. I thought it tasted better hot. I sliced the Fruit Strudel up and served it with custard (not homemade, come on… I’d done enough!) I was pleased with how well it had baked despite being left overnight, the filo was beautifully golden, layered nicely and there was a good proportion of fruit. 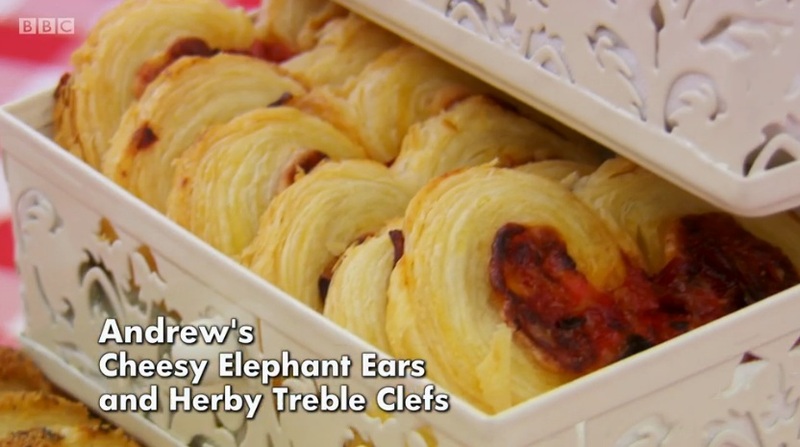 In some areas like the ends there was too much pastry, but if you’re tucking it in to seal it you can’t really avoid this. I’d definitely add more spices if I make it again, but you could taste the cinnamon. It all got eaten up and I got some good comments from colleagues and family. 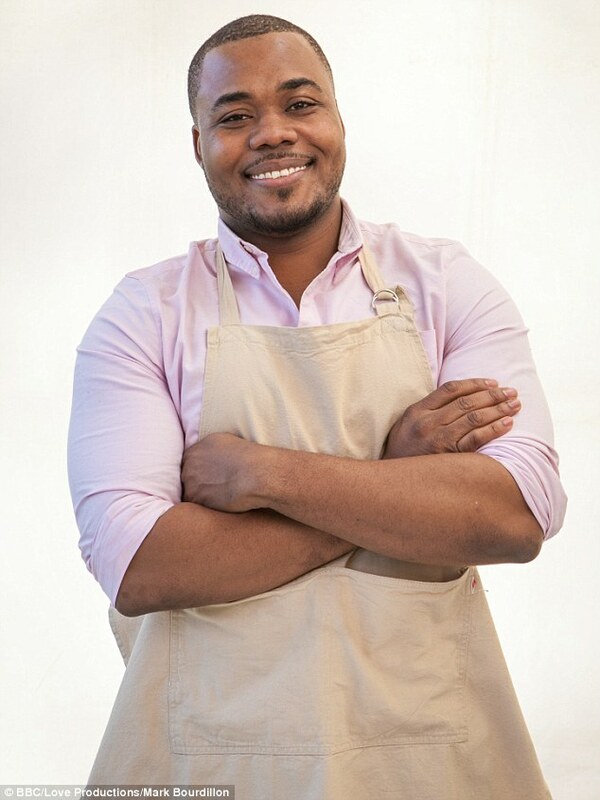 Overall I was really proud of myself and it felt good to overcome this baking challenge! I haven’t been to a Clandestine Cake Club meeting for ages, since last year actually. 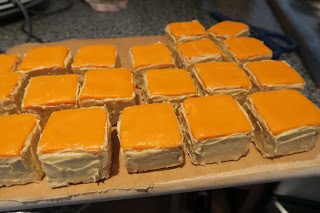 I usually attend one group in Manchester, but I decided to join another Manchester group for access to more local cake lovers and of course cake! I was so excited to attend my first Manchester South meet. The theme for the meeting was ‘Back To School’. I mulled over ideas for a while, before I settled on an apple cake. 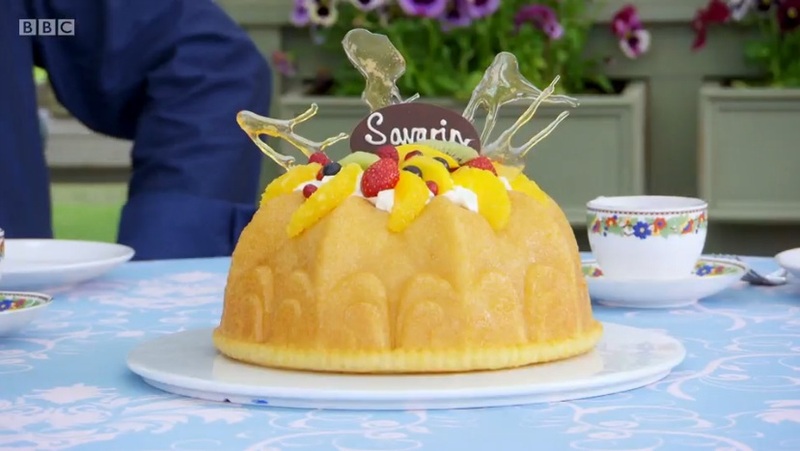 I originally wanted to do a 3D sphere apple cake, but I don’t have the correct tin and I was advised quite strongly by my boyfriend not to put a glass bowl in the oven as they can explode (!) So a flat apple it was. In my usual style I kind of made up this recipe as I went. 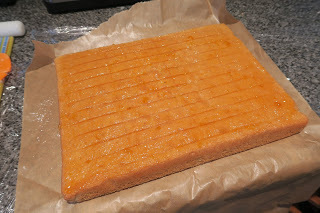 I used my Orange & Pomegranate Cake recipe as a starting point and it developed from there. First I grated 3 cooking apples. They went brown really fast! But this doesn’t matter. 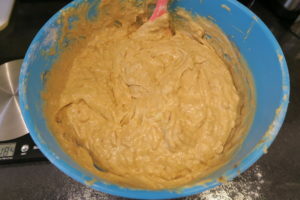 I then creamed together 300g butter, 180g golden caster sugar and 160g soft light brown sugar. 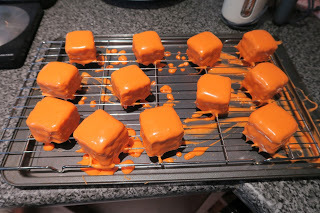 I only used the mixture of sugars as I had the golden caster lying around and thought I may as well use it. You can just use 340g soft light brown sugar if you don’t have both. I added 3 eggs and 1 tsp vanilla extract, and whisked well. I pressed a few layers of kitchen towel down onto the grated apple to soak up some of the moisture before I mixed it in. 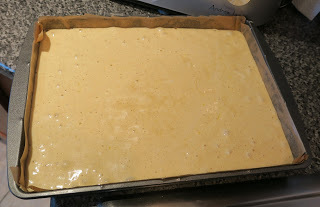 I folded in 2 tsp cinnamon, 1 tsp mixed spice, 1 tsp baking powder and 340g self raising flour, and smoothed the mixture into a lined rectangular tin. I baked on 180C/350F/Gas Mark 4 for 30 mins, then turned down to 160C/325F/Gas Mark 3 for a further 30 minutes. I checked on it a couple of times using a very thin skewer, and took it out once the skewer came out clean. This is an apple outline I found to give me a rough template to follow when cutting the cake. I started with the bottom and cut the dimple of the apple out. Then I cut out the top and leaf section. I did this freehand as the template was a lot smaller than the cake. It’s quite a simple shape so wasn’t difficult, I cut gently so the cake didn’t break. I made a red buttercream using red food colouring. I used Sugarflair Red Extra – the strongest red there is, but it still took a lot of it to get it to go red. I have found that red is the hardest colour to get a strong colour with when colouring buttercream. 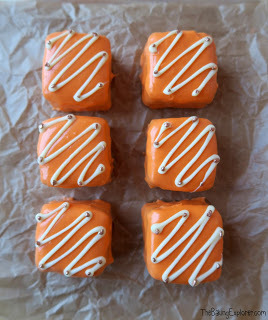 I smoothed the buttercream on using a palette knife. This was very tricky round the sides where the cake had been cut as the crumbs meant getting the buttercream to stick was troublesome. I then made a green buttercream using Sugarflair Mint Green. Again I had more trouble with the crumbs, but eventually got the ‘leaf’ coated. Of course you don’t have to go to all the trouble of shaping this cake into an apple and icing it. You can simply enjoy it alone, or with fresh raspberries and cream as I did with a piece of the cut offs! The Clandestine Cake Club meeting took place at Coasters in Sale, a small coffee shop opposite the Sale tram shop. 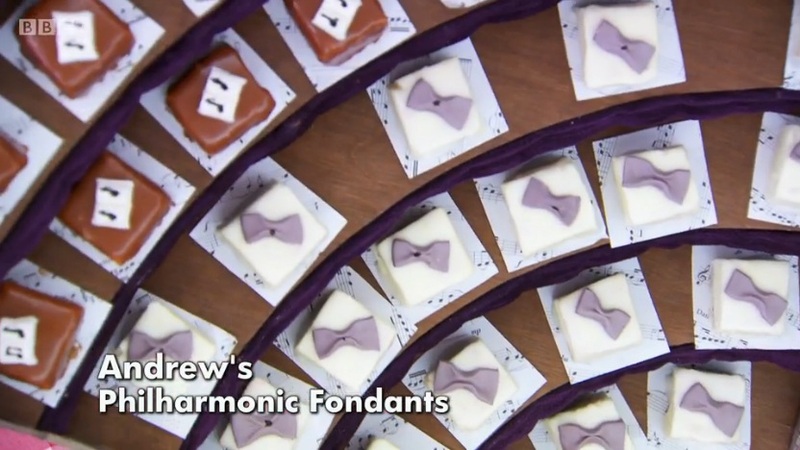 Check out their Facebook page – they make some amazing cakes, cheesecakes and other goodies! Avril who runs the group was so lovely and welcoming, she made this Carrot & Walnut Cake, the recipe was given to her by a teacher. This chocolate cake was made by Angela and I thought it was very tasty, especially the layer of jam in the middle! I’m not sure who made this cake, but it had a fantastic lemon flavour! Helena, who runs the Manchester North Clandestine Cake Club, came along with her gorgeous baby, and this gorgeous milk bundt cake too! I have never been a fan of salted caramel, but Venetta’s chocolate cornflake and salted caramel cake has converted me! It was so delicious! Mary made this fabulous cake full of childhood sweeties. I love bakewell tart and really enjoyed eating some of Hayley’s bakewell tart cake. Clare decorated her cake with a school emblem, and used fluff to make her marshmallow buttercream – a great idea! This was my favourite cake of the night, packed with apples and blackberries it had a great zingy flavour and was super moist. I took a piece of this home and had it with my lunch the next day! 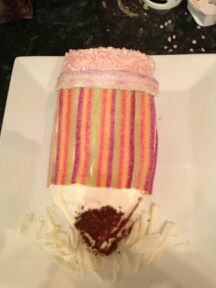 Owen, the ‘token male’ of the club, made this amazingly creative school crossing cake flavoured with honey and cinnamon. He made the ‘stop cake’ sign himself – I was really impressed! Claire couldn’t make it as she was stuck at the airport waiting for her boyfriend to arrive and his flight was delayed, but she sent me a photo of the pencil cake she made and I had to feature it as it’s fantastic! I got some great comments about my cake and I was so pleased. Two people recommended it to me, without knowing it was mine, I was really chuffed! Part of cake club is having your cakes tasted by other bakers, and having positive feedback is such a great feeling. 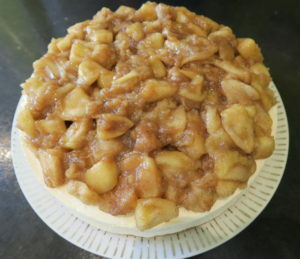 I am entering my apple cake into September’s Feel Good Food challenge, hosted by Victoria at A Kick At The Pantry Door. 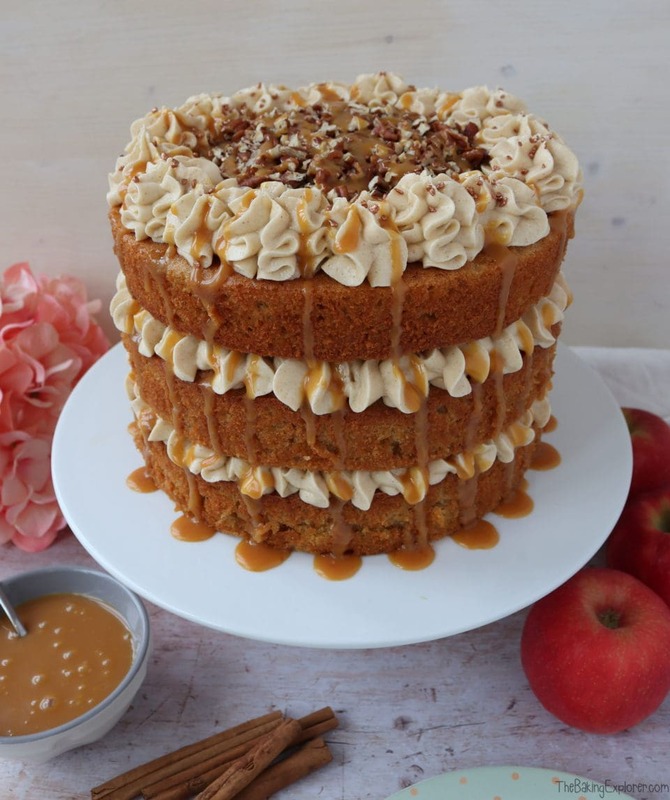 This month’s theme is apples and this cake fits the bill! I am also entering my apple cake into the Four Seasons Food September Challenge, hosted by Anneli from Delicieux and Louise from Eat Your Veg. Apples are a great autumn fruit perfect for using in this challenge. 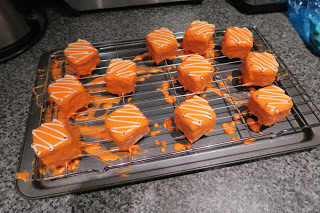 And finally, I’m entering the cake into Gourmandize UK’s competition to win a Kenwood Stand Mixer. They are looking for the best apple recipe.